TURISAS has officially started recording their upcoming 4th album. The band is currently working with drums at Atomic Spa studio in Helsinki, Finland, and will continue the recordings in different locations until the end of January. The upcoming album is to be released by Century Media Records in May 2013. “Writing this message is very difficult for me. I can’t tell you how hard it feels to step away from the path we’ve been walking together for the last 15 years, and to start a new era in my life without the band. There are many reasons for me to quit the band. The stress from the years spent on the road and our different artistic visions have lead to a mutual decision for me to step back and hand over the drumsticks for the next guy. In any case, it has been a great experience and all the memories from along the road are something that I will always cherish. The biggest thanks go to all the past and present members of the band, not to forget all the technicians and fellow drummers I’ve met in concerts and on tour – and, of course, especially to all the fans that have allowed us to grow to the level that Turisas is at today. Along with Lehtonen, also the touring bass player Jukka-Pekka Miettinen will be parting ways with the band, needing to focus on his own musical projects. With both former band members, the relationship remains warm and amicable. Nevertheless, the machine is not stopping here. We are proudly welcoming the newest members of the band: the new drummer, Jaakko Jakku, has already started recording his drum parts for the new album. The bass duties will be taken care by Jesper Anastasiadis. They are both excellent musicians and great personalities, and the rest of the band is enthusiastically looking forward to the shows together. After finishing recording the album at the end of January, Turisas will spend the spring on road. The rest of the year 2013 is shaping up to be very busy filled with festivals and tours. TURISAS are also happy to announce a brilliant way to end a brilliant year: the band will play a New Year’s Eve special show in Helsinki, Finland. This is the only show in the capital city in 2012 and at the same time a kickstart to a very busy year 2013. It will also serve as a memorable show to all the fans, as it will be the last one by the current line-up. No need to cry, we shall go out with a bang! We just announced the US tour in Feb/March 2013 with Firewind and Stolen Babies. On this tour, we’re also offering a strictly limited number of VIP Meet & Greet packages for all the shows. We had absolutely great time in the US last spring and we certainly hope to see you guys again! 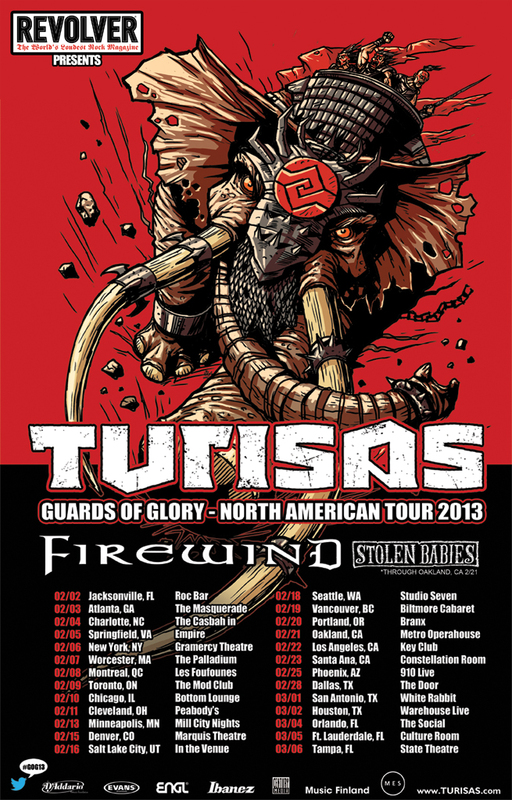 Battle metallers TURISAS will be returning to North America in February/March 2013 for a headlining tour featuring FIREWIND and STOLEN BABIES as special guests! In addition to previewing material from their upcoming release, TURISAS will be touring in support of their latest release, Stand Up And Fight, which is available for purchase at CM Distro here and at iTunes here. Press opportunities for TURISAS are available, so please contact nikki.law@centurymedia.com to schedule! Kuuntele Pauliinan buduaarissa keskiviikkona 7. marraskuuta kuultu vokalisti Mathias Nygårdin haastattelu kokonaisuudessaan oheisesta linkistä. Want to learn Finnish? Listen to Nygård’s brand new interview that was broadcast on Radio City channel yesterday. Word of the season: “kaamos”. Los maestros del Battle Metal Finlandés, TURISAS, se enorgullecen de anunciar su primera gira por América Latina. 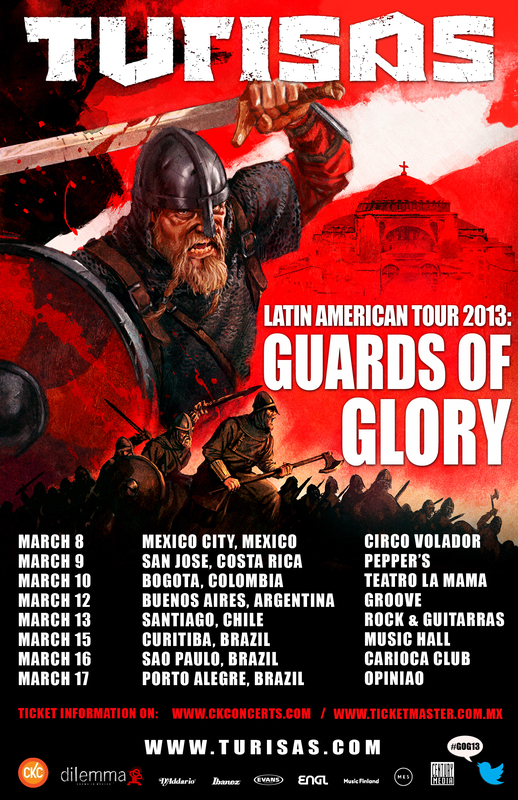 La banda realizará ocho conciertos en marzo de 2013, incluyendo fechas en México, Costa Rica, Colombia, Argentina, Chile y Brasil.